Click the Contact properties, Company properties, Deal properties, or Ticket properties tab to access the relevant property to edit. Click the name of the property to edit. Label: enter the name your users will see for the property. Description: enter the description of the property. Group: click the dropdown menu to select the property group the property should be in. Field type: click the dropdown menu to select its field type. Changing an existing property to a different field type may make values currently stored in the property invalid. It is recommended that you export all information prior to editing the property. A property's field type cannot be edited to Score, Calculated, or Date. A Score, Calculated, or Date property cannot be edited to another field type. Add to search: select to allow the property values to be searched. This option is available for Single line text field type properties in Marketing Hub Enterprise accounts only. Show in forms: select to allow the property to be used in your forms as a field. [Property type] options: this section is available for property types with options, such as Dropdown select and Radio select. Click the label and interval value of an option and enter the updated value. Label: the text that appears when the property is used in your HubSpot account in forms and records, and when it is used as a personalization token. Internal value: the value HubSpot tools and other integrations installed in HubSpot use to reference the option. It is not recommended to change this value as it may affect any functionalities referencing the option (e.g., lists, workflows and reports). Click to toggle Show in forms on to enable the option to appear when the property is used as a field in a form. Click the checkbox of an option and in the header, click Remove to delete the option. Click the checkboxes of two or more options and in the header, click Merge to merge the options together. Click add Add an option to add an option to the property. Click listView Load options to add multiple options to the property. 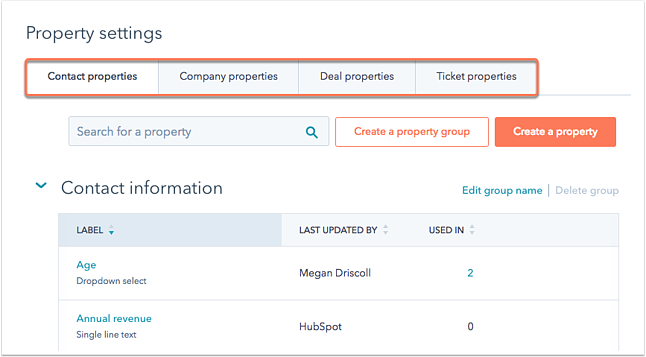 You can select a pre-existing set of options provided by HubSpot in the dropdown menu, paste in your options or copy options from another property. To delete the property completely, in the upper right, click Delete. If the Delete button is greyed out, the property is currently used in other HubSpot tools and can only be deleted once removed from those tools. Please note: to restore a deleted custom property, create a new custom property with the same Internal name, Field type, and its options, where applicable, as the deleted property.